If you&apos;re like most people, you&apos;ve been raised on cow&apos;s milk and probably continue to think that it&apos;s a healthy food that&apos;s a staple of the bodybuilding diet. Milk is inexpensive, tasty, rich in vitamins and minerals, and contains muscle-building protein. It is, simply, "nature&apos;s perfect food." If you believe the description of milk presented in the opening paragraphs of this article, then what I&apos;m about to tell you will forever smash your long held views on cow&apos;s milk. Because, here&apos;s the truth: much of the cow&apos;s "milk" that&apos;s produced today isn&apos;t really milk at all, but is a toxic soup of harmful chemicals that will destroy your health. Read on if you want to know what you&apos;re really drinking every time you sit down for a glass of "milk." Your views on cow&apos;s milk will be forever changed. Milk production used to be time consuming and labor intensive, but today&apos;s farmer can collect more milk in less time than ever before. While modern farming technologies have resulted in increased milk output, drugs are the real reason why milk production is at an all time high. "Modern Farming Technology" Increasing Output? Drugs Are The Real Reason. 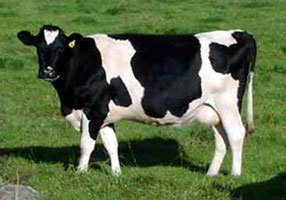 North American dairy cattle are routinely injected with rBGH - recombinant bovine growth hormone - to increase milk production. These injections frequently lead to utter infections that require aggressive antibiotic treatment therapies. Unfortunately, while rBGH injections result in increased milk production1, these drugs survive the pasteurization process. 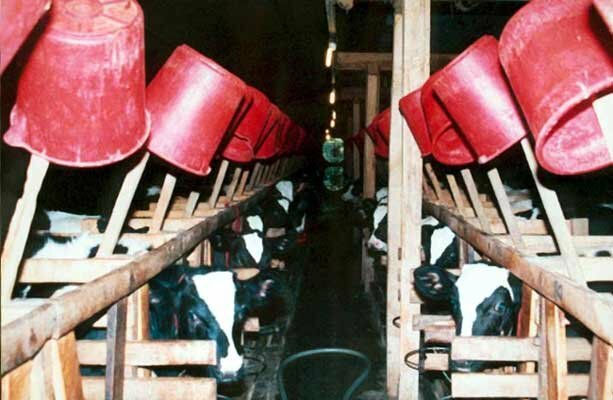 What&apos;s worse, the antibiotic treatments and the infectious white blood cells (pus resulting from rBGH injections) leak into the produced milk, and also survive the pasteurization process. Eventually, these contaminants find their way into your stomach and the stomachs of those you love when you drink milk. The bottom line? Today&apos;s cattle are like today&apos;s bodybuilders - chemically assisted. And, the use of milk producing drugs elevates the risk of health complications for human and animal. rBGH is injected into cows in order to elevate IGF-1 levels and increase milk production. Human and bovine IGF-1 is chemically identical,2 and this is important to note because when IGF-1 levels are elevated in injected cows, IGF-1 is secreted into the milk you drink. This IGF-1 also survives the pasteurization process.3 This means: your IGF-1 levels become elevated when you drink milk from a cow that&apos;s been injected with rBGH. Even children are not immune from the health effects of elevated IGF-1 levels, which can include childhood bone cancer.10 Sadly, diseases in youth associated with elevated IGF-1 levels don&apos;t end with bone cancer. Other side effects can include juvenile onset (Type I) diabetes (by destroying insulin-producing pancreatic cells), allergic reactions, allergy, ear and tonsillar infections, bedwetting, asthma, and intestinal bleeding. 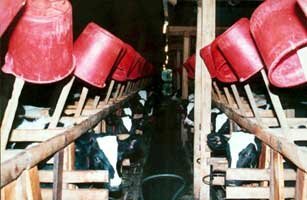 The side-effects of drinking contaminated milk vary because, aside from IGF-1 contamination, your milk may be contaminated with one (or all) of the following hormones: estradiol, estriol, progesterone, testosterone, 17-ketosteroids or corticosterone.11 The packaging of milk in plastic containers has increased contaminant levels. So, while the injection of cows with hormones and antibiotics is good news for major pharmaceutical companies and dairy farmers, the presence of these contaminants in your food supply is detrimental to your health. The scientific evidence so far presented is a challenge to dairy industry calls to increase milk consumption. Recent statistics show that 20% of all US produced dairy cow milk is contaminated.12 Given these alarming numbers and the dangers they represent, why would anyone want to consume liquid milk? Usually, the dairy industry and the medical profession recommend increasing milk intake to ensure adequate calcium intake. Calcium intake is critical for the prevention of degenerative bone diseases like osteoporosis and its related health effects. But is dairy cow milk a good source of useable calcium? Bovine milk causes sickness in the majority of the world&apos;s population. Epidemiological data show that calcium deficiency and osteoporosis rates are lower in non-milk consuming countries than in Westernized and industrialized milk-consuming nations. Human consumption of cow&apos;s milk is a recent development in evolution. Pre-humans and human ancestors did not drink cow&apos;s milk. Early fossil evidence shows no signs of osteoporosis. Milk is a source of calcium, but not the best source of absorbable calcium - other foods are better. As a source of protein, liquid milk is less than ideal - other foods are better. The majority of the world&apos;s population does not drink cow&apos;s milk. While ancient epidemiological data is scarce, fossil evidence shows that osteoporosis rates in ancient times were low, and modern data show that osteoporosis rates continue to be low in countries where milk consumption is limited. The Drinking Of Cow&apos;s Milk Is A Modern Habit. While the dairy industry claims that liquid milk is the ideal source of calcium, science shows that excessive dairy intake interferes with calcium absorption. Not only that, but the calcium to phosphorus ratio of liquid milk poor, and this makes calcium absorption from milk minimal at best. A critical distinction between liquid milk and milk proteins must be made here. While liquid milk is not an ideal protein source, liquid milk does contain milk proteins (edible acid casein) that have beneficial health effects - provided that you do not have a milk protein allergy. The key difference between contaminated liquid milk and milk proteins harvested from liquid milk is this: while liquid milk can be contaminated, isolated milk proteins - once removed from liquid milk - are purified by chemical processes. When liquid milk sours, milk proteins form curds on the liquids surface. These curds are removed, and dissolved into a hydroxide solution. They are later dried. This process completes the removal and purification process. Once they are removed, they are either agglomerated, lecithinated, or both - a process known otherwise as instantization. The distinction between milk proteins and liquid milk is critical, because while the liquid milk that milk proteins come from can be contaminated, once purified, isolated milk proteins are NOT contaminated. The separation and purification process above described breaks down milk proteins into amino acids that are not hormonally contaminated, and this is why using milk proteins in protein powder is safe, and drinking liquid milk is not! It&apos;s not difficult to get enough daily protein and calcium. Uncontaminated lean meats are an excellent source of protein, and green leafy vegetables are an excellent source of calcium that are also high in fiber and cancer fighting antioxidants. If eating green vegetables does not appeal to you, you can always supplement with a natural calcium product. Natural calcium is better absorbed than synthetic, so you won&apos;t have to take as much to see beneficial effect. If you feel that drinking liquid cow&apos;s milk is critical to your bodybuilding gains, then consume it in moderation with the information presented in mind. Today&apos;s cow&apos;s milk can have serious health effects. While the protein in milk may have beneficial effects on muscle gain, the side-effects that result from contamination can end up doing more harm than good. Unfortunately, this reality is unlikely to change because modern farming practices and pharmaceutical drugs are here to stay. While liquid cow&apos;s milk is a questionable food choice for bodybuilders, the good news is that you can still get enough calcium from vegetables, and you can use milk proteins from quality protein powders to build muscle and enhance health. T. B. Mepham and others, "Safety of milk from cows treated with bovine somatotropin," LANCET Vol. 344 (November 19, 1994), pgs. 1445-1446. Judith C. Juskevich and C. Greg Guyer, "Bovine Growth Hormone: Human Food Safety Evaluation." SCIENCE Vol. 249 (1990), pgs. 875-884. C. Xian, "Degradation of IGF-1 in the Adult Rat Gastrointestinal Tract is Limited by a Specific Antiserum or the Dietary Protein Casein," JOURNAL OF ENDOCRINOLOGY Vol. 146, No. 2 (August 1, 1995), pg. 215. Mariana Resnicoff,... and Renato Baserga, "The Insulin-like Growth Factor I Receptor Protects Tumor Cells From Apoptosis IN VIVO," CANCER RESEARCH Vol. 55 (June 1, 1995), pgs. 2463-2469. J. Gillespie, et al. Inhibition of pancreatic cancer cell growth in vitro by the tyrphostin group of tyrosine kinase inhibitors. Br.-J-Cancer, Dec 1993, 68(6), pp. 1122-1126. Atiq, et al. Alterations in serum levels of insulin-like growth factors and insulin-like growth-factor-binding proteins in patients with colorectal cancer. Intl-J-Cancer, May 1994, 57(4), pp. 491-497. T. Yashiro, et al. Increased activity of insulin-like growth factor-binding protein in human thyroid papillary cancer tissue. Jpn-J-Cancer-Res., Jan 1994, 85(1), pp. 46-52. E.A. Musgrove, et al. Acute effects of growth factors on T-47D breast cancer cell cycle progression. Eur-J-Cancer, 29A (16), 1993, pp. 2273-2279. J.A. Figueroa, et al. Recombinant insulin-like growth factor binding protein-1 inhibits IGF-I serum, and estrogen-dependent growth of MCF-7 human breast cancer cells. J-Cell-Physiol., Nov 1993, 157(2), pp. 229- 236. C.C. Kappel, et al. Human osteosarcoma cell lines are dependent on insulin-like growth factor I for in vitro growth. National Cancer Institute (NCI) Cancer-Res., May 1994, 54(10), pp. 2803-2807. Clark Grosvenor, Hormones and Growth Factors in Milk, Endocrine Review, 14:6, 1992. Valachovicova T, Slivova V, Sliva D. Cellular and physiological effects of soy flavonoids. Mini Rev Med Chem. 2004 Oct;4(8):881-7.